Instructor-facilitated online distance education courses offered for credit, as well over 300 non-credit online courses and a wide variety of general interest in-person community classes in areas including computers, art, sports, history, and cooking. Fremont County School District #2 (FCSD#2) serves Dubois K-12 students in one building on our school campus at 700 North First Street. We also serve 4-year-olds who will enter kindergarten the following year in a Pre-K program located at 400 Meckem Street. Enrollment for 2015-16 student was a total of 132: 56 students in grades K-5; 26 in grades 6-8 and 50 in grades 9-12. 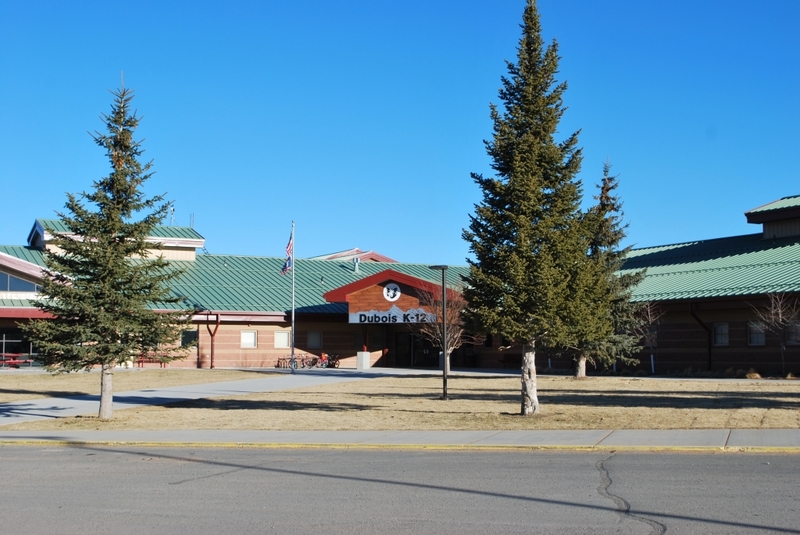 The Dubois school district was awarded full five-year accreditation by the Wyoming Department of Education in November 2015. We expect all students to attend regularly and graduate with a diploma that shows they are ready for college or a career of their choice. Our school vision is purposeful learning and empowerment through continuous education for all. We have a mission to provide innovative educational leadership and progressive educational programs that develop the unique potential of each individual. The District strives to embody these goals by providing a global and comprehensive curriculum. Our curriculum, based on the Wyoming State Content and Performance Standards, provides a strong academic core as well as a broad array of electives. These include a variety of online electives, offered with support from our own classroom teachers and guidance counselor, which are designed to advance students beyond the core curriculum. Student interest guides the choice of online electives. Fremont County School District #2 provides a personal computing device for every student in grades 6-12 and utilizes the cloud to expand learning opportunities beyond our brick and mortar school. We also provide a mobile lab of iPads and Apple computers for all students grades K-12. The District also provides individualized and/or specialized instruction to students with disabilities or those who may need extra time for re-teaching or review in order to become proficient on grade level standards. We use a response to intervention approach in the elementary school and support older learners with teacher-supervised study hall periods during the day and after school. We understand that not all learning takes place at school, and that all members of our community are lifelong learners with experiences to share. We value community participation and partnerships in our school by using adults as volunteers, guest speakers, and mentors. FCSD#2 also partners with the local Boys and Girls Club to provide learning experiences, field trips, and both tutoring and mentoring programs. Our extracurricular activities are supported and attended by most of our community stakeholders. Middle and high school students participate in volleyball, basketball and track for girls and football, basketball, wrestling, and track for boys. High school students also have the opportunity to participate in extracurricular drama and speech/debate. Extracurricular events are a highlight in our small community and are ways to building good relationships between the school and community. As a result of these strong relationships, our seniors are sent off to college with significant scholarship support from many of our civic clubs and organizations. Child care for ages 6 weeks to 10 years.